Kate Chopin’s family on her mother’s side was of French extraction, and Kate grew up speaking both French and English. She was bilingual and bicultural—feeling at home in different communities with quite different values—and the influence of French life and literature on her thinking is noticeable throughout her fiction. She adds, “I’ve also done a translation of ‘The Night Came Slowly,’ and it will appear on the website. It’s a site about literature. There are short stories and poems by Greek writers, and also others from the world of literature, translated into Greek by me or other Greek writers. 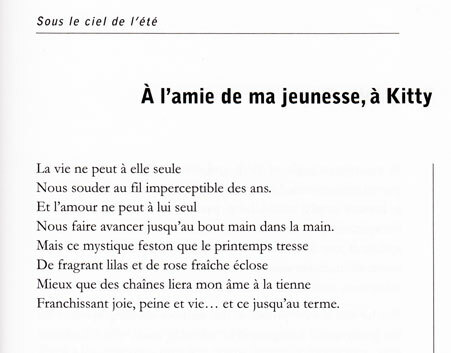 A Translation of Kate Chopin’s Poems into French. Gérard Gâcon’s volume, Sous le ciel de l’été, was published by l’Université de Saint-Étienne in 2009. The original English and the French translation of each of the forty-six poems are presented side by side, and the volume contains an introduction that includes a discussion of Chopin’s prose works “Athénaïse,” “Charlie”, “The Story of an Hour”, and “The White Eagle.” After the poems is a translation of “The White Eagle” into French, an annex with translated passages from Chopin’s 1894 diary and her 1897 dedication to Ruth McEnery Stuart in a copy of Bayou Folk, along with excerpts from an interview Chopin’s son Felix gave in 1949. The volume concludes with a brief chronology of Chopin’s life and a short bibliography. Gérard Gâcon has translated Shakespeare into French as well as work by Robert Herrick, Andrew Marvell, Lewis Carroll, and others British writers. Some of his translations are published in Paris by Gallimard in the prestigious Pléiade series. Thro’ joy, and grief, thro’ life–unto its close. “I’m writing to let you know about a new book with translations of twelve of Kate Chopin’s short stories that launched on June 20, 2011, in Porto Alegre, Brazil. “Each of the twelve short stories (in the original English and in Brazilian Portuguese) is followed by two essays–one from a PhD in literature and one from a medical professional (psychiatrists and/or psychoanalysts and one specialist in public health, a nationally renowned fiction writer). “Launching night in Porto Alegre was a big success,” Beatriz Viégas-Faria adds, “with more people than seats for the dramatic reading of ‘A Pair of Silk Stockings’ by actress/professor Mirna Spritzer (the Federal University of Rio Grande do Sul). And then we signed books until 10 PM, when the book store closed. “That was June 20, and then on Sept. 16, in São Paulo, we had another session of book signing, and actress Cris Nicolotti (stage and TV actor from São Paulo) was in charge of the dramatic reading of that same story. We had a good crowd attending, so we again had people lining up to have their books signed. Éditions Interférences in Paris published in 2011 a new translation of Kate Chopin short stories. The volume is titled Le Sorcier de Gettysburg, and the translations were done by Marie-Anne de Kisch. Éditions Interférences has also published translations of works by Ambrose Bierce, Louisa May Alcott, Dorothy Scarborough, and Charles Dickens. The Awakening has been translated into many languages. It first appeared in a French translation by Cyrille Arnavon in 1952. Mariko Utsu of Yonezawa Women’s Junior College adds that there have been three Japanese translations of The Awakening so far, each by a different translator. The one listed above is the second one. Mezame, translated by Kazuko Sugisaki, published by Bokushinsha in 1977. Antía Veres Gesto, a student of translation at the University of Vigo in Spain, tells us that Kate Chopin’s The Awakening has been translated into Galician. The translation was done by Ana Maria Valladares Fernández. It was published by Toxosoutos, Editorial, in 2003 and is available in both print and digital form. It seems that Chopin is not well-known in Galicia, but, according to reviews, the reception of The Awakening has been positive. The novel is thought of as one of the icons of the feminist movements of the 1960s. If you know of a translation into another language, would you contact us? Eulalia Piñero Gil has completed a new translation of The Awakening into Spanish. The edition, titled El despertar, is dated 2012 and is published in Madrid by Catedra, Letras Universales. The new volume includes a 100-page introduction to Kate Chopin and her work as well as a lengthy bibliography. Eulalia Piñero Gil is Associate Professor in American Literature and Director of the Gender Studies Seminar at Dpto. de Filología Inglesa, Facultad de Filosofía y Letras, Universidad Autónoma de Madrid, Spain. Laurie Gardner in Bucksport, Maine, tells us that The Awakening has been translated into Swedish. The translation, Uppvaknandet, was done by Margareta Lundgren and was published by Forum in Falköping, Sweden, in 1977. We have learned that the novel has also been translated into Malayalam, a language spoken by about 33 million people in the state of Kerala, on the Malabar Coast in southwestern India. The translation, Uyirppu, was done by Krishnaveni and was published by Kairali Books / Kabani Books in 2012.